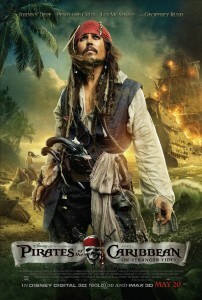 The latest installment of Disney’s most lucrative franchise, “Pirates of the Carribean: On Stranger Tides,” is a bit of a mess. Frankly, so are we. After nine months off, we’re a bit rusty, a bit punchy, but still eager to get back to podcasting. Johnny Depp and crew head off in search of the Fountain of Youth, barreling through the streets of London, storming across the sea, and heading deep into an oddly familiar tropical jungle. (Tikka tikka tikka…) The flick didn’t float Jen’s boat, but Ryan enjoyed the ride, for a Popspotting score of 5/10. If you saw it, and it seems like most of America did, we’d love to hear what you thought! This episode is a beta test of a new format, switching from longer shows a few times a month to shorter, simpler episodes a few times a week. Will it work? Only time and our listeners will tell. So do let us know what you think, but please be gentle. It’s rough, but it’ll get better. Probably.